Thus, all companies must use the indirect method - either to prepare the cash flows statement or the supplemental reconciliation disclosure. However, management did report that they do provide quarterly disclosure to requesting investors including balance sheet, income statement, cash flows statement and occupancy levels, but no management discussion and analysis. 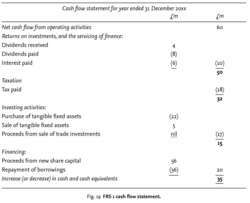 The audited income and cash flows statement of APL for the periods ended Aug.